Growing soybeans averaging more than 100 bushels an acre takes more than a great farmer. Most of all, it requires cooperative weather that maximizes the crop throughout the season. After that, though, a creative, thoughtful farmer eager to learn what makes the crop produce more beans per pod and more pods per plant makes the difference. Switch. Matt Miles, farming on productive Delta soils at McGehee, in southeast Arkansas, was born and raised a cotton farmer. But when soybeans and corn became more profitable than cotton in 2006, he switched much of his acreage. 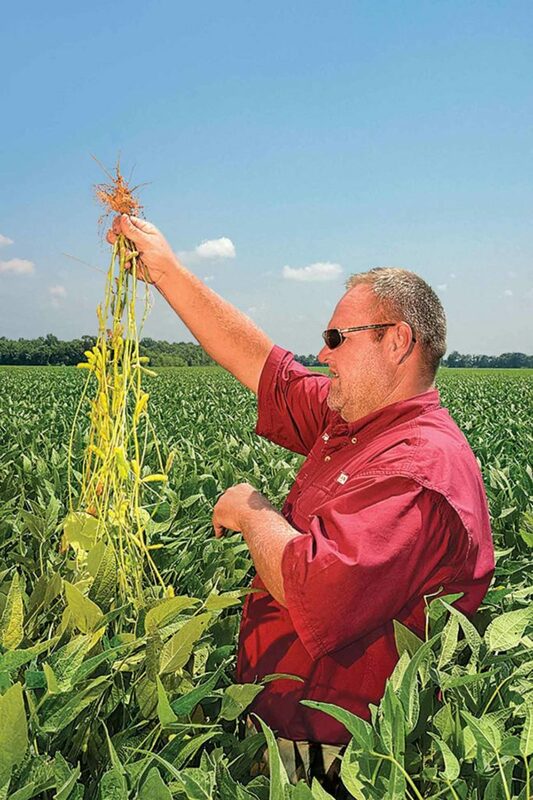 With the help of his crop consultant, Robb Dedman, he studied agronomic techniques for them and questioned why Arkansas’ yields of those crops weren’t higher. They looked at yield-limiting factors. By 2013, working together, they pushed soybeans to more than 107 bushels per acre, one of three farms in the state to surpass the 100-bushel mark that year. The state average soybean yield that year was 43.5 bushels per acre. 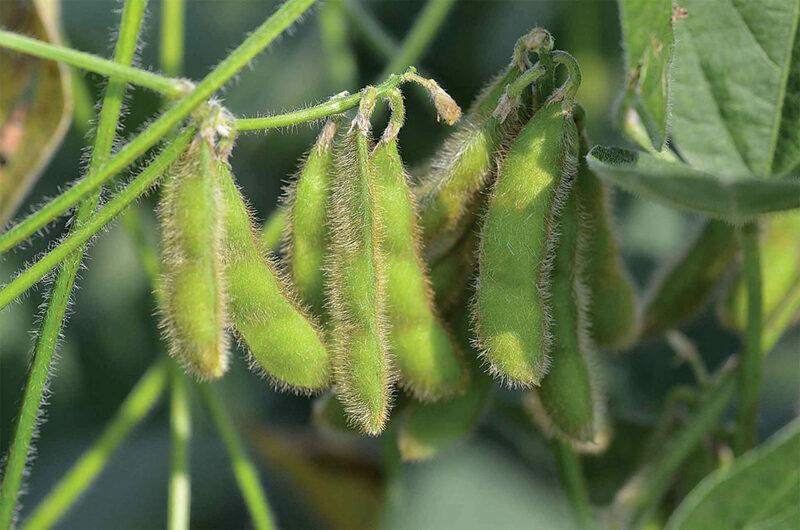 Miles credits the Arkansas Soybean Association’s “Grow for the Green” contest with providing an initial $50,000 to the first grower hitting the 100 bushel per acre mark. It wound up being split three ways. “We didn’t do it for the money, but the prize money offered by the contest gave us the incentive to reach for the top. We are continually trying to get more from less,“he says. Last season was the only time since then he’s failed to reach the century mark, but his son, Layne, did. “Some years, conditions just aren’t perfect for high yields. I shoot for 90 bushels per acre on all of mine. But in 2016, I made 73 bushels. We’ve had other years when it was in the 80s on all of it. We fertilize for 90. We treat it all the same. We don’t treat contest acres in any special way,” he says. Consultant Robb Dedman works helps maintain Miles Farms’ top yields. Miles does the simple things that make sense, like crop rotation. Soybeans following corn average as much as 15 bushels per acre more than soybeans following soybeans, for example. “That’s hidden money,” he says. Plus, he furrow irrigates precision-leveled fields based on soil tensiometer readings and weather station data. He plants on 38-inch beds. That lets him get an earlier start in the spring and begin irrigation as soon as needed. Selecting the proper variety is another key. Indeterminate Group IV soybeans tend to produce the best yields on this farm. Fertility is also important. He applies chicken litter except on high phosphate-level fields. He adds variable-rate potash, as well. “I’m now using broiler litter. I did use hen litter but the pH got almost too high. I like the broiler litter. It’s been good to me,” he says. On-farm trials. Miles tests over 100 varieties on the farm, zeroing in on ones that do well in his conditions. “If you do on-farm research with the varieties on the same soil type, in the same spot and strip trial them, you can learn a lot of things that will pay off in the long run. That can help you focus on what’s best for your particular situation,” he says. Dedman says Miles is the kind of farmer he enjoys helping. “Matt is a progressive, innovative person. He wants to get better. He wants to start strong and finish strong. He makes sure the right variety gets on the right field. He knows fertility is key to success. If one acre of soybeans yields 100 bushels, we want every acre to yield 100 bushels. Where it falls short, we want to find out why,” Dedman says. Higher yields? James Wray, a Poinsett County, Arkansas, grower, set a new state record with more than 118 bushels last season. Miles likes seeing more farmers join the club. “We’re poised to break through even more barriers,” he says.